The Roland VR-50 HD Tech managers are well versed in the concept of doing more with less—and, in conjunction, attempting to get as much bang for their buck as possible. With video pretty much established as the communications vehicle, AV manufacturers are combining efficiency and cost-effectiveness in all-in-one products designed to simplify operations by enabling users to perform a number of functions that, traditionally, were only achievable with task-specific units. In other words, one-box-per-job is now evolving into one-box-fits all. 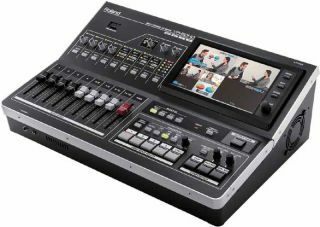 Roland’s John BroadheadNewTek’s Ellen Camloh Lectrosonics offers its ASPEN Series of DSP matrix audio processors such as its all-in-one conferencing solution ASPEN Trio, which is a matrix mixer with a telephone hybrid and a two-channel power amp. The series also provides TCP/IP control over Ethernet. Moore says that the ability to transport audio over Ethernet is in demand, especially for facilities like universities, where linking a number of classrooms in real-time is a necessity. “A university may have 17 rooms that are all set up with these all-in-one units, and that’s great when that class is small. But what happens when that professor becomes extremely popular?” Moore added. “With transport over Ethernet, they can set up very simple networks between those 17 rooms, and then have the option of routing Room 12 to Room 5 for overflow, and yet get the audio from Room 5 back to Room 12 so the instructor can answer questions and interact with the students in that classroom.” All this can be achieved, of course, through a simplified interface. NewTek’s Tricaster in action But where manufacturers are making their biggest pitch for all-in-one products is in the area of ROI (return on investment). “You can try to put it together yourself, which means that you go out and get a video switcher, and then an audio mixer. And, then if you’re going to stream, for example, you have to pull those two pieces together and make sure they’re in sync, so you’ve got that box. Then you have to monitor, and you need an encoder of some kind to get it streamed or captured, and then you need the ability to make it sound good. So now what you have on the table is quite a few pieces,” Broadhead illustrated. And, with all of these different components comes the requirement for someone with enough technical know-how to operate and maintain them, 24/7. There’s no arguing that seeing is believing. Bruce Bartolf, principal and CTO at Gensler, a global architecture, design, planning, and consulting firm, has spent the last several years working to find a way to make his organization’s enterprise video communications look good, sound good, and be simple to deal with. “One of the things that global organizations struggle all the time with is creating a professional internal communications structure that fosters collaboration and communication,” Bartolf said. To Bartolf, who works out of Gensler’s San Francisco office, video was the key in making this happen, using the existing tool sets the company was already familiar with, such as GoToMeeting and Microsoft Lync. He also wanted a system that would enable the capture of meetings and, eventually, Webcasting. Currently, VR-50 HDs reside in Gensler’s offices in San Francisco, New York, and Washington, D.C.
Bartolf notes that the system takes 10 minutes to set up, and once the presets are programmed, just as much time to learn. But the real pay-off, he notes, is the experience that he and his colleagues enjoy during meetings. “It creates a whole level of interactivity and it makes the meetings more interesting, it makes the content more vibrant, and it makes the content much more applicable. People feel much more connected,” he said, adding that this is extremely important for professionals working in such a visual industry.